Now that I have your attention, let’s see if your cute little butterball is overweight. Your fingers and eyeballs are probably the best test around. Scales often lie to us, having trouble telling the difference between muscle and fat, but also because there is such a variety in normal sizes of cats. "I have a fat cat, but it is not my fault." I have a different opinion for fat dogs, but that is a whole different story. There, now that we all feel better, let’s get down to losing some kitty belly. What makes this such a difficult task is that cats are amazingly efficient creatures. When someone rings your doorbell and the dogs go crazy, what does your cat do? Perhaps roll over on the couch to better see the door, but most of the time they can’t even be bothered with that. However, in the wild, a cat must catch approximately six mice a day just to stay alive, they also only successfully catch their prey 1 out of every 4 hunting episodes. Therefore, they must track, hunt and attempt to catch a mouse 24 times a day. My cat hunts twice: once in the morning to get her morning yum-yums, and once at night to get her evening yum-yums. No tracking, no hunting, no pouncing, no rending of flesh - just a banquet feast for 30 seconds. And that (if you are still reading this far into the article) is how we are going to get your Chubby-Wubby to lose some weight... We gotta get them to move! Notice I did not say put them on a diet. We will get more into food later on, but first, let’s work on exercise. Place their food bowl in a more difficult location: on a raised surface, their tree house, anything that will make them move a bit to get to it. The picture on the left is my home-made tree house (that of course the cats don’t play on anymore), but they have to climb up to get their food. Make sure the location is safe and that they are actually able to get to it! Cat fence: Yes, you read that right. I am recommending that your cat goes outdoors. I don't mean a free for all, return to the wild to hunt 24 times a day kind of outdoors, but a properly enclosed, safe outdoor exercise area. You can easily and relatively inexpensively convert an existing fence to a cat-proof fence. Many companies offer these conversion kits. Your kitty will get all the benefits of being outside (fresh air, exercise, mental stimulation) without the dangers (dogs, other cats, cars). 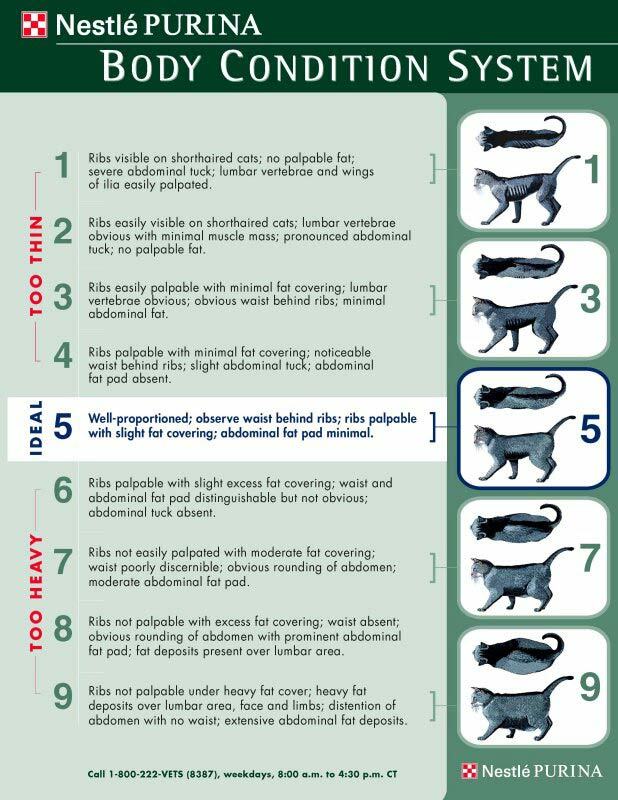 Just don’t forget flea and tick preventatives if you do this! Get another cat: I think all homes should have 2 cats... most of the time. All cats are individuals, but they usually love to have a companion around to play, groom, and be lazy with. Laser lights: My favorite mode of activity with my cats because I can be sitting in my La-Z-Boy and my cats are tearing up the living room running after it. Remember that cats are sprinters - they will play for a minute or two and then want to rest. They are the big cat taking down an antelope - fast as lightening but not built for a marathon. It is amazing how much fun a $12 laser pointer from Office Depot can be. Caution - don’t point it into their eyes! Automatic laser lights: The lazy (or very busy!) man's laser light. Works while you are gone, and your kitty will never know when it is coming! Many versions are out there, a lot at less than $30. Good old fashion feather on a string: It kicks that predatory instinct on high. Just don’t leave the string on the floor in case a kitty might decide to eat it! Fake mouse: The little plastic bodied/rabbit fur cheapies at any pet store. I probably have a dozen under my fridge right now. My cats love them. Milk Rings: I should market these things, call them Dr. Lapham’s Special Cat Toy. Only $1.99 on sale now! I have a dozen or more also under fridge as we speak (apparently I have a lot of things under my fridge). If you want your cat to have no energy and NOT lose weight - put them on a traditional weight loss diet (ie - high fiber, low calorie). In other words, we need to feed them food that their bodies were meant to digest, to give them the energy to be active, and to satisfy them to not bug us at 5AM for breakfast: a canned high protein diet, home cooked diet, or raw diet- we can have the debate in person as to what is best for your cat. The key is NOT high carbohydrate, NOT dry kibble. Once we have switched them to a canned high-protein diet, then we can start to reduce their total amount of energy (food) a small amount at a time, generally starting with a 10% reduction. This should be done under a supervision of a veterinarian as we also want to make sure they are getting adequate nutrition. It took time to put the weight on, so it will take time to get the weight off. We don’t care so much how long it takes, just as long as your cat’s weight is going the right way. Indoor Pet Initiative - Ohio State Univ, College of Veterinary Medicine - tons on info to keep our cats sane! Catinfo.Org – Great info on many feline-related topics, in particular nutrition. So let's get to it! We've given you a lot of great suggestions to help your furry feline friend shed some weight this New Year, the rest is up to you!